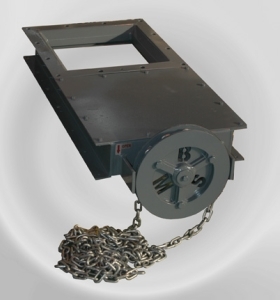 Bulkmatic Knife Gates are manufactured in two basic forms - “Hand operated” or “Chain Wheel operated”. Laser profiling results in a light but robust knife gate. The inlet ports are generously sized with a protective cover shroud insert. This shroud ensures that contact of material with the sealing strips above the gate blade is minimised reducing wear and maintenance. The outlet port opening is larger than the inlet ensuring minimal chances of material hangup. 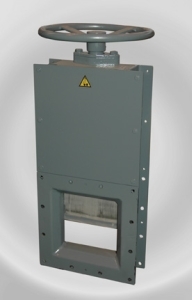 The design of the stuffing box is such that the packing can be changed with the knife gate blade in position and only the cover plate removed for access. 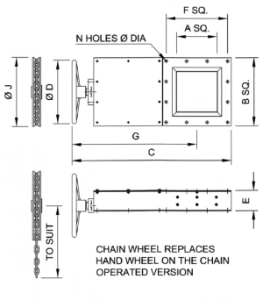 The Hand Wheel operated valve uses a conventional hand wheel while the Chain Wheel operated version is ideal for hand operation where the gate is at an elevated position. Limit or proximity switches can be fitted as optional extras. Knife Gates can also be supplied in stainless steel. Standard sizes include: 150, 200, 250, 300, 350, 400 and 500. Other sizes manufactured on request.